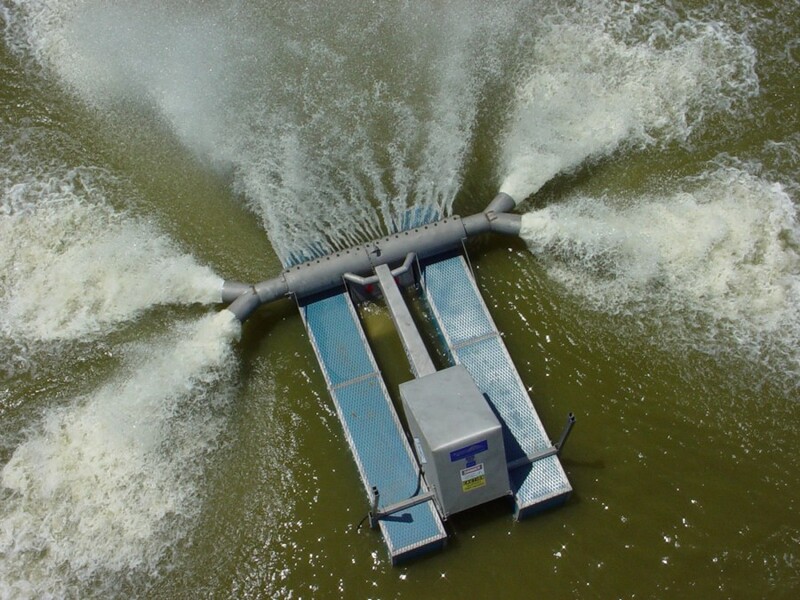 A powerful new high-efficiency aerator, designed to provide maximum aeration while using only a fraction of the energy required by other models, has been introduced by Airmaster Aerator of DeRidder, Louisiana. The new aerator — the 50 H.P. Turbo X-Treme Magnum — is a high-efficiency, floating/surface aerator that can pump 12.5 million gallons of water per day. Powered by an energy-saving 50 H.P. motor, it incorporates a “turbo” blower and a double-sided impeller to achieve high-capacity water movement — with maximum aeration and mixing. Due to its efficient design and operation, the patented 50 H.P. Turbo X-Treme Magnum has replaced aerators requiring up to three times the horsepower, resulting in substantial energy savings to the user. a wide variety of applications, including municipal, industrial, agricultural and disaster recovery – and performs especially well in “deep-water” applications. An optional Chemical Injection Port, for adding enzymes and de-foamers, is available. Ruggedly constructed of stainless steel, the 50 H.P. Turbo X-Treme Magnum is built for reliable, long-term operation — and carries a one-year warranty. For more information on the energy-efficient 50 H.P. Turbo X-Treme Magnum aerator, please contact Dean Caldwell at Airmaster Aerator, Inc., P.O. Box 546, DeRidder, LA 70634.